Hezbollah leader Hassan Nasrallah recently railed against the influence of Gulf money and political support in Lebanon. Hezbollah leader Hassan Nasrallah recently railed against the influence of Gulf money and political support in Lebanon. In February, Saudi Arabia announced it was cutting support to Lebanon’s military and security services. While Hezbollah may welcome the absence of Gulf support, the cancellation of Saudi aid for arms purchase and the imposition of travel restrictions for Gulf nationals will punish many people facing a concerted Gulf Cooperation Council economic statecraft. The GCC objective is to punish Lebanon for adopting Hezbollah’s foreign policy as its own. The GCC states have collectively imposed an informal set of economic sanctions on Lebanon. How will this GCC economic statecraft reverberate in the wider region and reflect back inside the Gulf? The tools of economic statecraft focus on the use of financial pressure to pursue foreign policy goals. These tools include foreign aid, trade policy, labor policy (specifically toward migrant labor), and restrictions on the movement of capital. Saudi Arabia is leading the charge to force Lebanon to sharply recalibrate its ties to the Iran-backed political and military wings of Hezbollah. The travel bans and warnings put most pressure on Lebanese residing in the Gulf, as the question of re-entry and renewed residency visas create insecurity for families. Additionally, Gulf countries have deported and canceled visas for a number of Lebanese nationals, with as many as 1,000 people affected in Kuwait, and there have been similar recent revocations of visas in Bahrain. On February 24, Qatar and Kuwait followed Saudi Arabia and the United Arab Emirates in issuing a travel warning to their citizens planning to visit Lebanon. Gulf nationals have been a declining portion of tourists to Lebanon since 2011, with traffic dropping by about 55 percent. Though Gulf citizens are a trickle of the tourist population in Lebanon, they are an important economic force over summer holidays. Most visitors to Lebanon, nearly 42 percent of international arrivals according to Moody’s, are Lebanese expatriates, many of them Gulf residents returning home. Lebanese nationals residing in the Gulf states provide an important source of human capital, and they send home a significant amount of financial capital. 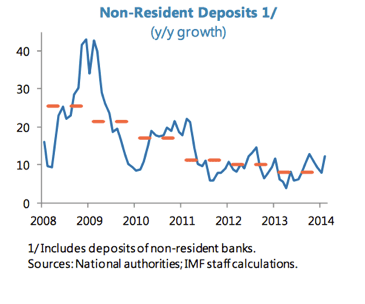 They provide non-resident deposits in Lebanese banks, which are vital to the local economy. The International Monetary Fund has noted that these inflows of deposits have been resilient, even in the current regional climate of civil war in neighboring Syria and the downturn in oil prices affecting Gulf states, likely because of the continued support of remittances from the Gulf. In 2009, the IMF estimated 400,000 Lebanese nationals were working in the Gulf states. The population is large, but also notable because it is a well-educated expatriate population servicing a number of sectors, from finance to tourism. Any concerted effort to diminish the Lebanese expatriate population within the Gulf would have consequences inside Gulf economies and in the Lebanese economy as well. The role of remittances cannot be underestimated. Remittance flows from Arab countries, mostly the GCC states, comprised over 40 percent of total remittances to Lebanon in 2014, or $6.2 billion, roughly 5 percent of gross domestic product, according to Moody’s. The IMF lists Lebanon among the world’s largest recipients of remittances as a share of GDP. Remittance inflows topped $6.7 billion in 2010, of which at least 60 percent was from oil exporters. The stability of Lebanon relies on its expatriate community residing in the Gulf now more than ever. Their remittances have been crucial to the Lebanese economy as the country is under extraordinary pressure from the influx of Syrian refugees. 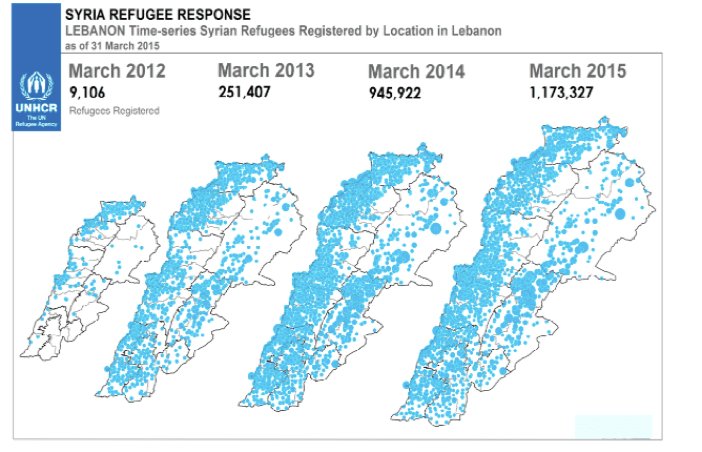 The official Syrian refugee population in Lebanon, according to the U.N. refugee agency, UNHCR, reached over 1.1 million in 2015. Unemployment rates for Lebanese have risen as Syrian refugees are willing to do non-skilled labor at lower wages and job creation is increasingly a problem. Foreign aid to Lebanon comes in many forms from the Arab Gulf states. Saudi Arabia has rescinded its promise of $4 billion in arms and security support ($3 billion was to finance French military sales, while $1 billion was to support Lebanese police training). Perhaps more important is the unofficial aid that Gulf states provide in deposits to the Lebanese central bank, Banque du Liban, estimated at $860 million. These funds are a legacy of deposits made in 2006, when Gulf states showed political and financial support for Lebanon in its war with Israel. A central bank withdrawal could put Lebanon’s credit rating at risk; with its status already B2 negative according to Moody’s, a further decline would make borrowing difficult. Lebanon also maintains a currency peg, at 1,507.5 Lebanese pounds to one U.S. dollar, which is under increasing pressure. 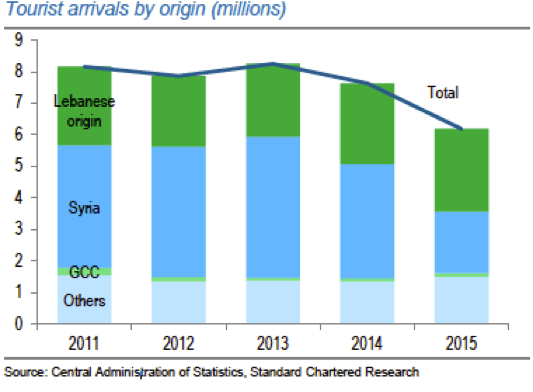 Trade flows between the GCC and Lebanon are relatively stable, and a sizable portion of Lebanese exports, about 27 percent according to Moody’s, go to the GCC, minus Oman. The concern from Gulf states, especially Saudi Arabia, is that a Gulf aid dollar does not seem to have the same purchasing power in terms of influence as support from Iran. The “value for money” priority in foreign aid and foreign policy developing in the Gulf states, particularly Saudi Arabia and the UAE, is an emerging doctrine that is meant to put regional allies on notice. For those receiving aid and political support, it is increasingly clear that the Gulf states will adjust their economic statecraft based on “performance” and support of key political objectives, especially regarding Iran. Aid and political support for regional allies will not come in the form of a blank check. There are risks inherent in an activist economic statecraft agenda targeting Lebanon. The Gulf states may also impact their own economies by making Lebanon more vulnerable to economic crisis. The Syrian conflict has made Middle East tourism an oxymoron. Just as travelers may lump together Istanbul with Damascus and even Dubai, investors often get a case of emerging market mix up. Regional upheaval tends to have a contagious effect. The Arab Gulf states will also need to seek international capital. In fact, as much as half of the GCC investor base in debt markets is within the Middle East and North Africa region, according to Emirates NBD. 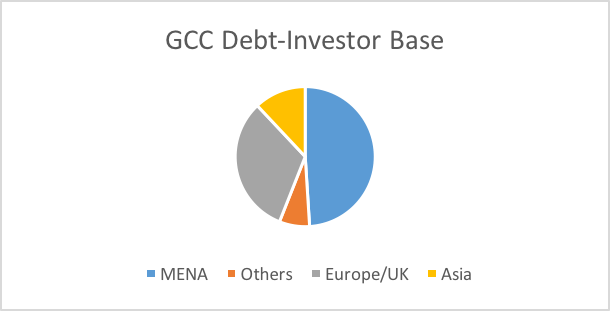 While established state-related entities and fixed-income issuers in Dubai and Qatar, for example, can attract debt investors from the West, most GCC debt is sold to neighbors. If the neighborhood deteriorates, loss of value impacts the region more broadly. At the moment, the Arab Gulf states have determined that a message must be relayed to Lebanon, and to other regional allies as well. It is a message that has been heard, loudly and clearly, coming after decades of financial support to Lebanon. Can Lebanon Repair Relations with Saudi Arabia?